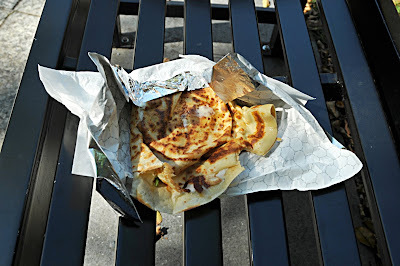 I've had my eye on this crepe stand for a while, just waiting for the right time to give them a try. Today was just the day, nice and warm but not too hot. 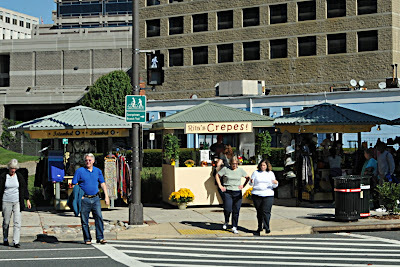 Rita's Crepes is a little outdoor stand across Woodmont Avenue from Barnes & Noble in the Bethesda Row section of Bethesda, MD. There isn't any seating there so I went down the Capital Crescent trail to the rest area to eat. The menu is limited, 4 sweet crepes and only a single savory crepe. Since this was my lunch, I went for the savory: Fresh spinach, mozzarella, tomato sauce, and capers. It was cooked fresh in front of me in a few minutes and wrapped in foil so I could eat it on the go. The crepe was filling and the cheese was nice and melted. The tomato sauce I was a bit concerned about, but it added a nice flavor to it. The Spinach released a little bit of water that made it to the bottom of the wrap but not nearly as much as I expected. The capers added a salty little surprise now and then. The crepe was good, but not great, it was somehow missing a bit of punch. Because of this and because of the limited selection of savory crepes, I'd recommend trying the sweet crepes, that looks like it is more the strength of this stand. I wonder if the people of Silver Spring are laughing about this, I can almost hear them saying "Typical Bethesda, trying to be all upscale. A hot dog cart isn't good enough for them, nooo, they have to have crepes". Those crepes are the best least expensive thing in the area, if someone wants crappy over-priced crepes, escargot, etc... they should go to Mon Ami Gabi. I take that back, I meant it as a joke.